So like last time, I'll start this post by discussing Rorion Gracie's seminal intro lesson in a little more detail. Rorion is largely responsible for expanding Brazilian jiu jitsu outside of his native Brazil. In the late '70s, he travelled to the US for a second time, with the intention of establishing BJJ in North America. Initially he found work as an extra in Hollywood, while teaching BJJ out of his garage. Thanks to those connections, over the years Rorion was able to encourage actors, directors and writers to come train with him. Around 1990, Ed O'Neill had a part in a popular sitcom, Married With Children: his acting friends had been pestering him to give the Gracie Academy a go. To shut them up, O’Neill reluctantly agreed to try it out. Rorion, who has always had a knack for marketing, offered O'Neill a simple challenge. If Rorion sat on top of him, could O'Neill throw the much smaller Brazilian off? O'Neill decided to accept: as a big guy, he reasonably thought it should be easy. However, try as he might, O'Neill couldn't budge Rorion from his position. Smiling, Rorion then suggested that perhaps O'Neill might find it easier to hold Rorion down. After the demonstration O'Neill had just felt, he felt that surely he would be able to use his size advantage to stay in place for at least a few seconds. However, again Rorion surprised him, with a quick reversal. O'Neill was hooked, and over a decade later, he earned his black belt. He tells the story himself in this video. If you find you need more leverage, most commonly if they are posting with their free hand to stop your roll, you could attempt to dislodge that by pushing their arm off the ground. Alternatively, the legendary Rickson Gracie has a great detail, which he demonstrated in a video recently. Simply angle your head away from the shoulder you're rolling over: this increases your range of motion. When you've successfully rolled them over, that puts you in the guard position. Remember to posture up when you reach that position: if you are leaning forwards, they can pull you down move right into a submission. Next up, the 19:30 mixed class, where I was trying out teaching the collar drag for the first time. Having my girlfriend there was extremely useful. I've mentioned in the past that I always look for feedback, but it can be tough to get. Part of that is because people are nice, so they can find it hard to be critical. However, when you've been in a relationship with somebody for almost fourteen years, honest criticism tends not to be a problem. My girlfriend had loads of good advice and was helpful both before, during and after the lesson. The first thing I would change next time is the timings. Normally I would have people spend four minutes each drilling the techniques. However, I think for this class, shortening that time would make sense, maybe to two or three minutes. So, I think next time I could comfortably fit in a bit more technique within the hour. For example, you can still trap and and roll if they bring an arm under your head: simply reach back as if you were combing your hair to trap their arm, then progress as before. Generally when I do this, I like to be able to drive my elbow into their hip and stomach, as I find that helps with leverage. Rener prefers to put his hand right into their hip, at least when he teaches this technique on Gracie Combatives. The Rickson detail was handy, as that meant I had a good pointer up my sleeve for progressive resistance. Watching the drilling, I think I need to put more emphasis on turning to the knees. I did mention it during the demonstration, but it would have been better if I also added in a drill at the start. As I already talked too much, turning explanation into drilling makes a lot more sense. That's a good general principle I should apply more going forward. The drills I did include at the start were bridging, then bridging side to side. Next time, I add to that side to side bridge with a turn to the knees, basing on your shoulder and foot. A few people arrived a little late (understandable, as this is a fairly early class at 18:30, so with traffic etc I can imagine getting there from work isn't always easy. I'd much, much rather people come in late than not come at all! ), so I recapped what I'd shown. I probably won't do that next time, instead showing it to people when we get to drilling. That would probably help the class flow better. I wasn't sure if I was going to include sparring or not, but as there were two experienced women there, that gave me the opportunity to ask if they wanted to spar. If it's a similar situation next time, I will make sure I ask people before I do this, because it ended up with two women sparring and everyone else watching. Although they both said it was fine afterwards, I know I'd feel a bit under pressure in their place. So, I'll be sure to check in advance next time, but it did work. After watching the experienced women spar, as I'd hoped that encouraged the beginners to give it a try. Finally, I put together a short questionnaire for people to fill in, so that even if people decide one class was enough, I can at least get some information from them both on what I can do to improve and what kind of reasons they had for trying out the class. What a great class. Following the 'combatives' is a good idea, too. The questionnaires have proved interesting so far, though it's only just been the first lesson of course. At the moment, the response to "what are you hoping to get out of BJJ?" has been 80% "trying something new/fun/fitness". "Self defence" accounts for 20% of the responses, and even then it's coupled with either "fitness" or "fun". 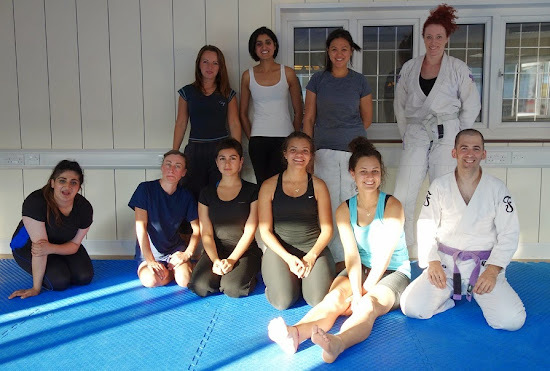 BJJ is a really great intense method of staying in shape as well for self defense. You should definitely pace yourself because of the stress it adds to your body and allow yourself to fully get comfortable with the techniques.